A total of 1977 exoplanets (in 1257 planetary systems, including 490 multiple planetary systems) have been identified as of 1 November. 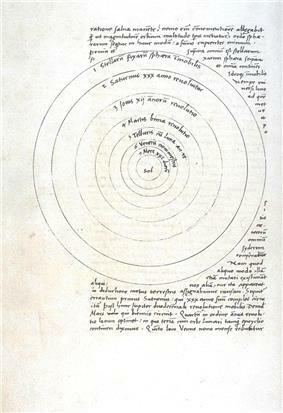 The idea was first proposed in western philosophy and Greek astronomy as early as the 3rd century BC by Aristarchus of Samos, but had received no support from most other ancient astronomers. Planets orbiting pulsars have been discovered, and pulsars are the remnants of the supernova explosions of high-mass stars. A planetary system that existed before the supernova would likely be mostly destroyed — planets would either evaporate, be pushed off of their orbits by the masses of gas from the exploding star, or the sudden loss of most of the mass of the central star would see them escape the gravitational hold of the star, or in some cases the supernova would kick the pulsar itself out of the system at high velocity so any planets that had survived the explosion would be left behind as free-floating objects. Planets found around pulsars may have formed as a result of pre-existing stellar companions that were almost entirely evaporated by the supernova blast, leaving behind planet-sized bodies. 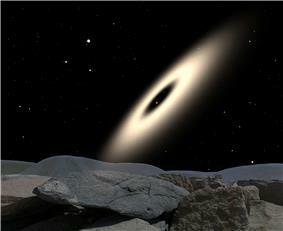 Alternatively, planets may form in an accretion disk of fallback matter surrounding a pulsar. Fallback disks of matter that failed to escape orbit during a supernova may also form planets around black holes. As stars evolve and turn into red giants, asymptotic giant branch stars and planetary nebulae they engulf the inner planets, evaporating or partially evaporating them depending on how massive they are. As the star loses mass, planets that are not engulfed move further out from the star. The Solar System consists of an inner region of small rocky planets and outer region of large gas giants however other planetary systems can have quite different architectures. Many systems with a hot Jupiter gas giant very close to the star have been found. Theories, such as planetary migration or scattering, have been proposed for the formation of large planets close to their parent stars. At present, few systems have been found to be analogous to the Solar System with terrestrial planets close to the parent star. More commonly, systems consisting of multiple Super-Earths have been detected. Most stars have planets but exactly what proportion of stars have planets is uncertain because not all planets can yet be detected. The radial-velocity method and the transit method (which between them are responsible for the vast majority of detections) are most sensitive to large planets in small orbits. Thus many known exoplanets are "hot Jupiters": planets of Jovian mass or larger in very small orbits with periods of only a few days. A 2005 survey of radial-velocity-detected planets found that about 1.2% of Sun-like stars have a hot jupiter, where "Sun-like star" refers to any main-sequence star of spectral classes late-F, G, or early-K without a close stellar companion. This 1.2% is more than double the frequency of hot jupiters detected by the Kepler spacecraft, which may be because the Kepler field of view covers a different region of the Milky Way where the metallicity of stars is different. It is further estimated that 3% to 4.5% of Sun-like stars possess a giant planet with an orbital period of 100 days or less, where "giant planet" means a planet of at least 30 Earth masses. It is known that small planets (of roughly Earth-like mass or somewhat larger) are more common than giant planets. It also appears that there are more planets in large orbits than in small orbits. Based on this, it is estimated that perhaps 20% of Sun-like stars have at least one giant planet whereas at least 40% may have planets of lower mass. A 2012 study of gravitational microlensing data collected between 2002 and 2007 concludes the proportion of stars with planets is much higher and estimates an average of 1.6 planets orbiting between 0.5–10 AU per star in the Milky Way, the authors of this study conclude that "stars are orbited by planets as a rule, rather than the exception". 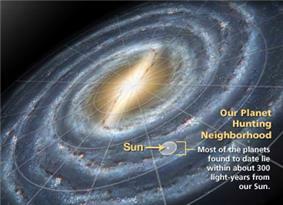 In November 2013 it was announced that 22±8% of Sun-like stars have an Earth-sized planet in the habitable zone. Stars of spectral category A typically rotate very quickly, which makes it very difficult to measure the small Doppler shifts induced by orbiting planets because the spectral lines are very broad. However, this type of massive star eventually evolves into a cooler red giant that rotates more slowly and thus can be measured using the radial-velocity method. A few tens of planets have been found around red giants. Rogue planets ejected from their system could retain a system of satellites. A 2012 study of the Kepler spacecraft data found that smaller planets, with radii smaller than Neptune's were found around stars with metallicities in the range −0.6 < [m/H] < +0.5 (about four times less than that of the Sun to three times more), whereas larger planets were found mostly around stars with metallicities at the higher end of this range (at solar metallicity and above). In this study small planets occurred about three times as frequently as large planets around stars of metallicity greater than that of the Sun, but they occurred around six times as frequently for stars of metallicity less than that of the Sun. The lack of gas giants around low-metallicity stars could be because the metallicity of protoplanetary disks affects how quickly planetary cores can form and whether they accrete a gaseous envelope before the gas dissipates. However, Kepler can only observe planets very close to their star and the detected gas giants probably migrated from further out, so a decreased efficiency of migration in low-metallicity disks could also partly explain these findings. A 2014 study found that not only giant planets, but planets of all sizes have an increased occurrence rate around metal-rich stars compared to metal-poor stars, although the larger the planet, the greater this increase as the metallicity increases. The study divided planets into three groups based on radius: gas giants, gas dwarfs, and terrestrial planets with the dividing lines at 1.7 and 3.9 Earth radii. For these three groups the planet occurrence rates are 9.30, 2.03, and 1.72 times higher for metal-rich stars than for metal-poor stars, respectively. There is a bias against detecting smaller planets because metal-rich stars tend to be larger, making it more difficult to detect smaller planets, which means that these increases in occurrence rates are lower limits. Stellar multiplicity increases with stellar mass: the likelihood of stars being in multiple systems is about 25% for red dwarfs, about 45% for Sun-like stars, and rises to about 80% for the most massive stars. Of the multiple stars about 75% are binaries and the rest are higher-order multiplicities. 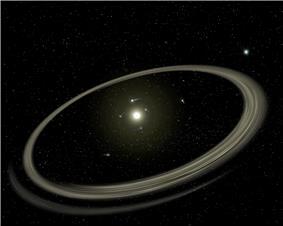 Some planets have been discovered orbiting one member of a binary star system (e.g. 55 Cancri, possibly Alpha Centauri Bb), and several circumbinary planets have been discovered which orbit around both members of binary star (e.g. PSR B1620-26 b, Kepler-16b). A few planets in triple star systems are known (e.g. 16 Cygni Bb) and one in the quadruple system Kepler 64. The Kepler results indicate circumbinary planetary systems are relatively common (as of October 2013 the spacecraft had found seven circumbinary planets out of roughly 1000 eclipsing binaries searched). One puzzling finding is that although half of the binaries have an orbital period of 2.7 days or less, none of the binaries with circumbinary planets have a period less than 7.4 days. Another surprising Kepler finding is circumbinary planets tend to orbit their stars close to the critical instability radius (theoretical calculations indicate the minimum stable separation is roughly two to three times the size of the stars' separation). In 2014, from statisitcal studies of searches for companion stars, it was inferred that around half of exoplanet host stars have a companion star, usually within 100AU. This means that many exoplanet host stars that were thought to be single are binaries, so in many cases it is not known which of the stars a planet actually orbits, and the published parameters of transiting planets could be significantly incorrect because the planet radius and distance from star are derived from the stellar parameters. Follow-up studies with imaging (such as speckle imaging) are needed to find or rule out companions (and radial velocity techniques would be required to detect binaries really close together) and this has not yet been done for most exoplanet host stars. Examples of known binary stars where it is not known which of the stars a planet orbits are Kepler-132 and Kepler-296. Most stars form in open clusters, but very few planets have been found in open clusters and this led to the hypothesis that the open-cluster environment hinders planet formation. However, a 2011 study concluded that there have been an insufficient number of surveys of clusters to make such a hypothesis. The lack of surveys was because there are relatively few suitable open clusters in the Milky Way. Recent discoveries of both giant planets and low-mass planets in open clusters are consistent with there being similar planet occurrence rates in open clusters as around field stars. The open cluster NGC 6811 contains two known planetary systems Kepler-66 and Kepler-67. Habitable zones have usually been defined in terms of surface temperature, however over half of Earth's biomass is from subsurface microbes, and the temperature increases as you go deeper underground, so the subsurface can be conducive for life when the surface is frozen and if this is considered, the habitable zone extends much further from the star, even rogue planets could have liquid water at sufficient depths underground. The Venus zone is the region around a star where a terrestrial planet would have runaway greenhouse conditions like Venus, but not so near the star that the atmosphere completely evaporates. As with the habitable zone, the location of the Venus zone depends on several factors including the type of star and properties of the planets such as mass, rotation rate and atmospheric clouds. Studies of the Kepler spacecraft data indicate that 32% of red dwarfs have potentially Venus-like planets based on planet size and distance from star, rising to 45% for K-type and G-type stars. Several candidates have been identified but spectroscopic follow-up studies of their atmospheres will be required to see if they really are like Venus. The Milky Way is 100,000 light-years across, but 90% of planets with known distances lie within about 2000 light years of Earth, as of July 2014. One method that can detect planets much further away is microlensing. The WFIRST spacecraft could use microlensing to measure the relative frequency of planets in the galactic bulge vs. galactic disk. So far, the indications are that planets are more common in the disk than the bulge. Estimates of the distance of microlensing events is difficult: the first planet considered with high probability of being in the bulge is MOA-2011-BLG-293Lb at a distance of 7.7 kiloparsecs (about 25,000 light years). Population I, or metal-rich stars, are those young stars whose metallicity is highest. The high metallicity of population I stars makes them more likely to possess planetary systems than older populations, because planets form by the accretion of metals. The Sun is an example of a metal-rich star. These are common in the spiral arms of the Milky Way. Generally, the youngest stars, the extreme population I, are found farther in and intermediate population I stars are farther out, etc. The Sun is considered an intermediate population I star. Population I stars have regular elliptical orbits around the Galactic Center, with a low relative velocity. Population II, or metal-poor stars, are those with relatively low metallicity which can have hundreds (e.g. BD +17° 3248) or thousands (e.g. Sneden's Star) times less metallicity than the Sun. These objects formed during an earlier time of the universe. Intermediate population II stars are common in the bulge near the center of the Milky Way, whereas Population II stars found in the galactic halo are older and thus more metal-poor. Globular clusters also contain high numbers of population II stars. In 2014 the first planets around a halo star were announced around Kapteyn's star, the nearest halo star to Earth, around 13 light years away. However later research suggests that Kapteyn b is just an artefact of stellar activity and that Kapteyn c needs more study to be confirmed. The metallicity of Kapteyn's star is estimated to be about 8 times less than the Sun. ^ Schneider, Jean (10 September 2011). 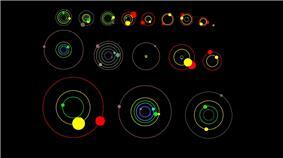 "Interactive Extra-solar Planets Catalog". ^ Newton, Isaac; Cohen, I. Bernard; Whitman, Anne (1999) [First published 1713]. The Principia: A New Translation and Guide. University of California Press. p. 940. ^ Podsiadlowski, Philipp (1993). "Planet formation scenarios". In: Planets around pulsars; Proceedings of the Conference 36: 149. ^ Stuart J. Weidenschilling & Francesco Marzari (1996). 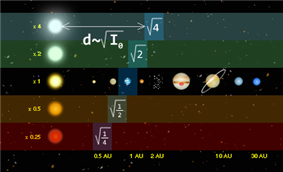 "Gravitational scattering as a possible origin for giant planets at small stellar distances". Nature 384 (6610): 619–621. ^ Fabrycky, Daniel C. (2010). "Non-Keplerian Dynamics". ^ a b Cassan, A.; Kubas, D.; Beaulieu, J. P.; Dominik, M; et al. (2012). "One or more bound planets per Milky Way star from microlensing observations". ^ a b Marcy, G.; et al. (2005). "Observed Properties of Exoplanets: Masses, Orbits and Metallicities". ^ David P. Bennett; Jay Anderson; Ian A. Bond; Andrzej Udalski; et al. (2006). "Identification of the OGLE-2003-BLG-235/MOA-2003-BLG-53 Planetary Host Star". Astrophysical Journal Letters 647 (2): L171–L174. ^ Petigura, E. A.; Howard, A. W.; Marcy, G. W. (2013). "Prevalence of Earth-size planets orbiting Sun-like stars". ^ Bonfils, X.; et al. (2005). "The HARPS search for southern extra-solar planets: VI. A Neptune-mass planet around the nearby M dwarf Gl 581". ^ L. Vu (3 October 2006). "Planets Prefer Safe Neighborhoods". ^ J. A. Johnson (2011). "The Stars that Host Planets". ^ Buchhave, L. A.; et al. (2012). "An abundance of small exoplanets around stars with a wide range of metallicities". Nature. ^ Israelian, G.; et al. (2009). "Enhanced lithium depletion in Sun-like stars with orbiting planets". ^ Welsh, William F.; Doyle, Laurance R. (2013). "Worlds with Two Suns". Scientific American 309 (5): 40. ^ Amend, J. P., & Teske, A. (2005). Expanding frontiers in deep subsurface microbiology. Palaeogeography, Palaeoclimatology, Palaeoecology, 219(1–2), 131–155. Elsevier. ^ Charles H. Lineweaver (2000). "An Estimate of the Age Distribution of Terrestrial Planets in the Universe: Quantifying Metallicity as a Selection Effect". Icarus 151 (2): 307–313. ^ T. S. van Albada; Norman Baker (1973). "On the Two Oosterhoff Groups of Globular Clusters". Astrophysical Journal 185: 477–498. ^ Dressler, A. (March 1980). "Galaxy morphology in rich clusters - Implications for the formation and evolution of galaxies.". The Astrophysical Journal 236: 351–365.